In this region – where two seasons are clearly defined – the Honey Gold mango crop thrives in red, sandy soil during the dry, and humidity and monsoonal rain in the wet. We pick at night when it's coolest. Our most remote Honey Gold mango orchards are spread over 80 hectares on two properties south of Katherine in the Northern Territory’s Top End, producing fruit from 25,000 trees. One contracted grower also produces our mangoes here. The wet season in Katherine spans November to April and is characterised by intense humidity followed by tropical downpours. Temperatures typically range from 25 degrees celsius and 33 degrees celsius with humidity rising above 80 per cent. When the dry season begins, there is no rain until the following October. During the dry’s warm, sunny days and cool nights, temperatures range from 21 to 32 degrees celsius and humidity drops to 60-65 per cent. At this time, three bores draw water from the aquifer and the Katherine River to feed the crop. In the Top End, Honey Gold mangoes need at least 10 consecutive days of minimum temperatures below 15 degrees celsius to achieve good flowering and a promising volume of fruit. Dry winters – when flowering occurs – are best, and it takes about three weeks from the onset of flowers to the first fruit. A small team manages the Katherine crop, bringing in picking crews during harvest. 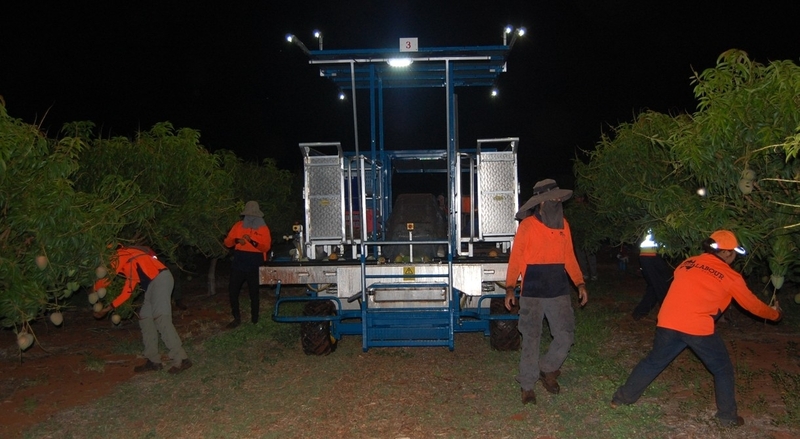 Once picked, fruit is delivered to a contracted packer in Katherine, then transported all over Australia.